What does BAZ mean in Unclassified? This page is about the meanings of the acronym/abbreviation/shorthand BAZ in the Miscellaneous field in general and in the Unclassified terminology in particular. A metasyntactic variable used to stand for some unspecified entity, typically the third in a series after foo and bar. 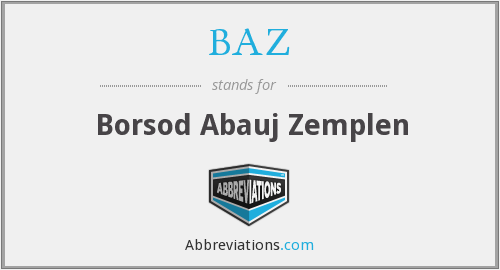 How popular is BAZ among other acronyms? "BAZ." Abbreviations.com. STANDS4 LLC, 2019. Web. 25 Apr. 2019. <https://www.abbreviations.com/term/2056873>.